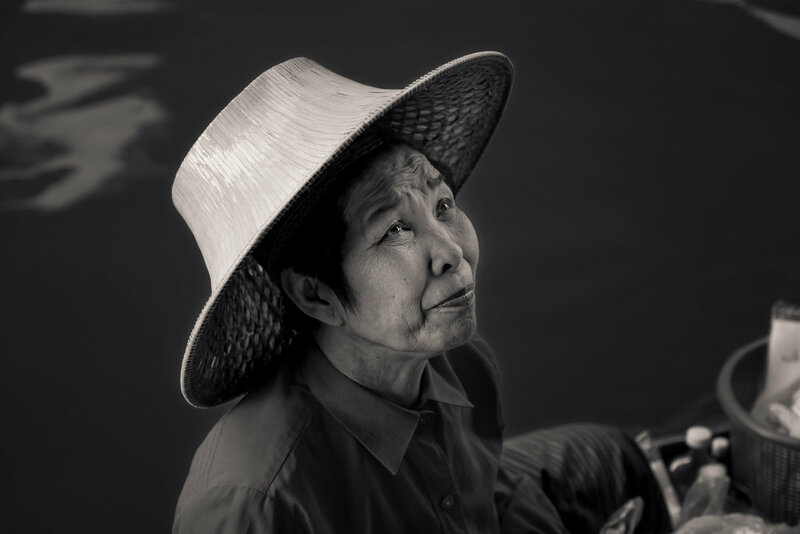 An elderly woman, displaying a trusting expression, at the Floating Markets near Bangkok, Thailand. The Floating Markets in and around Bangkok have been a major tourist drawcard for many years. I finally made the decision to visit the largest one at Damnoem Saduak around 1 1/2 hours out of Bangkok. I made the trip on a Sunday on the advice that the lower levels of traffic in Bangkok over the weekend would shorten the trip by an hour or more. However, with less traffic in town came many more tourists at the Floating Market. I can tell you it was packed. A close up of a snake with photographs at the Floating Markets near Bangkok, Thailand. While I’ve run specially constructed photography tours, I’m not the kind of person who normally signs up for a tour. But, from time to time, I’ve joined a small half or full day tour as a way of seeing how a variety of tour providers run their operation. This particular tour was run along the lines of "here we are, see you back at the bus in 30 minutes", prior to us heading onto the next location. While that might seem a bit lax it suited me because all I wanted to do was to make photos. It was a busy day and movement, at each location on the tour, was somewhat restricted by the large numbers of tourists. Despite a 6:30am departure from my hotel, by the time our minibus had picked up folks from other hotels it was around 8:45 by the time we arrived at Damnoem Saduak. A snake handler poses for photographs with a large, yellow python at the Floating Markets near Bangkok, Thailand. Any hopes of beautiful, soft early morning light were gone. Fortunately the buildings lining the narrow waterway provided large areas of open shade, ideal for portrait photography. The problem was ensuring your subject matter and surrounding areas were all evenly lit. This was not always possible, particularly when photographing from one of the canoe-like boats that are used by retailers and tourists alike. Careful framing, exposure and image processing saved the day. Although, due to the hard light, I choose not to photography certain scenes. It's my view and practice to ask permission prior to photographing someone who has not commissioned me to do so. I love the interaction, working in close with folks I would otherwise have no connection. But the floating market at Damnoem Saduak provided me no such luxury. It's a busy and fairly raucous environment, thanks to us tourists and the way some of the hawkers approach us. 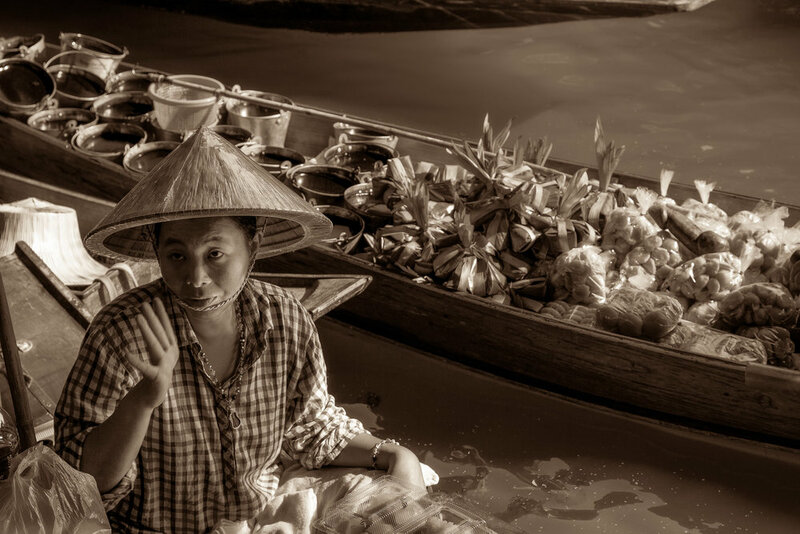 A young woman amidst the hussle and bussle of the Floating Markets near Bangkok in Thailand. In any case, due to the high quantities and frequency of tourists, the local folk are very used to photographers. With this thought in mind I had no trouble making candid (i.e., unposed) pictures. That's not to say the subjects were not aware they were being photographed. When they were I felt they were happy to go about their business and let me make photos. Whenever possible I would end such encounters with a thank you and a smile, which is likely to be appreciated and to bring an extra moment of happiness into the subject’s life. My intention is to make beautiful, life-affirming images. That fact gives me both motivation and courage to do more of the same. I employed a Canon 5D Mark II camera with a Canon 24-105mm f/4 IS zoom lens. This is a great, general purpose zoom lens and it served me well for a number of years on many photography adventures. I'd certainly recommend the Damnoem Saduak Floating Markets for folks who love people-based, candid photography. Photographing moving subjects, often from a moving platform, under high contrast lighting will make for a challenging photographic adventure. The trick is to ensure you’re photographing at a reasonably high shutter speed (i.e., 1/250 second or higher) and that you photograph evenly lit scenes. That means a scene that’s sunlit or shaded, but not a combination of both. On days of high contrast what you exclude from the frame is, therefore, as important as what you include. The fact that the tour only allowed us 1 1/2 hours at the location also made it tough. As well as arriving much earlier in the day, and benefiting from softer light and a less chaotic environment, I would have preferred twice the time I had available to me. Nevertheless, the challenge is to make the best of the situation we have available to us and I'm happy with the results. With care, good technique and the right camera kit you should also be pleased.